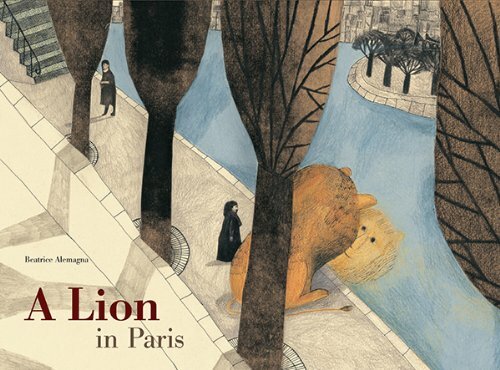 A Lion in Paris is a humongous hardcover picture book, lovingly created by Beatrice Alemagna, a multi-award-winning children’s author/illustrator. A lion, bored of his life in the grasslands-venture out to Paris to seek job, love and a future. But little did he known it will not so easy. Beatrice Alemagna managed to tell a tale that is appealing to everyone. You will see the lion exchanging a glance with Mona Lisa in the Louvre Museum, or looking down high above from Eiffel Tower. These and many more landmarks of Paris is brought alive with her sensitive juxtapose of collage and illustrations. The language is whimsical and in the end, the reader will be curious to find out what is the fate of the lion. Will he go back to the grasslands or will he manage to find his future in Paris? I particularly like how the artist’s composition in creating each page, and the text never overwhelms the illustration but complement it perfectly. Greatly recommended if you love picture books.